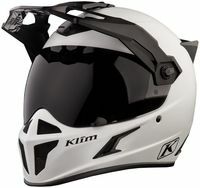 THE LIGHTEST ADV HELMET: KLIM developed the KRIOS ADV Helmet to destroy the conventional performance parameters of the modern Adventure Touring helmet. Innovative construction techniques and supreme material sourcing combine in the ultimate multi-function and completely versatile Adventure Helmet. It’s the only helmet weighing under 1500 grams in North America. Premium Polycarbonate Anti-Scratch shield tech takes the lead with Pinlock® ready systems standard to ensure a clear road ahead. Clear and Smoke shields included in the box, along with a clear Pinlock insert. Replacement cheek pads for the Klim Krios helmet. Replacement Transitions photochromic face shield for the Klim Krios Helmet. KLIM introduces the first optically superior shield system capable of the highest performance in all light conditions….